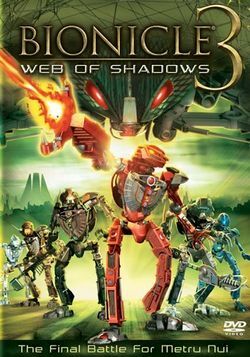 BIONICLE 3: Web of Shadows is the third BIONICLE movie released on DVD by LEGO. The movie tells the 2005 BIONICLE story, and features new characters such as the Rahaga, the Visorak and the Toa Hordika. The Toa Metru were riding the Lhikan vehicle when they suddenly crashed into an abandoned dump. When everyone got to their feet, they re-entered the city of Metru Nui on their mission to rescue to Matoran. The team noticed the destruction of Metru Nui, and the odd, green webs covering it. Whenua told the team that the webs were spun by Visorak. However, due to the overconfidence of their leader, Vakama, the team was quickly ambushed and captured by the spider-like Visorak. Condemned to die by the Visorak king Sidorak and his repulsive viceroy, Roodaka, the Toa were saved by six Rahaga. But the venom of the Visorak had done its damage - the six Toa had been mutated into grotesque half-Toa, half-beast monsters called Toa Hordika. Having decided to recover the Matoran and worry about themselves afterwards, the Toa Hordika and Rahaga quickly began executing a plan of action, while fighting off both Visorak and the Toa's own beastly natures. Eventually, Vakama strayed from the other Toa to have some time alone to think and was ambushed by a mutated Muaka. Rahaga Norik came to try and help, but Vakama turned him away to go off on his own- and was promptly ambushed and captured by more Visorak. He was brought to Roodaka, who saw him as a useful pawn and offered him command of the Visorak horde. Eventually, Vakama accepted this offer, and Roodaka sent him on a mission to prove his worth: capture the Rahaga. With Vakama defected to evil, his first assignment was to capture the Rahaga, then to tell Norik to deliver a message to the Hordika. After assaulting Norik and leaving the Hordika came to check on the Rahaga and found Norik in a pile of rubble. Armed with the disturbing knowledge that Vakama was evil, the remaining Toa Hordika and Norik quickly changed priorities and began to track down the mythical Rahi named Keetongu - a legendary creature said to have the ability to counteract Visorak venom. Eventually, Keetongu was found, but he refused to cure the Toa; nevertheless, he decided to help them against the spider invaders. Meanwhile, having earned Sidorak's trust - and command of the Visorak - with the five captured Rahaga, Vakama settled down in the Coliseum, now the headquarters of the Visorak, to await the final battle with the Toa Hordika...which came none too soon. Facts about "BIONICLE 3: Web of Shadows"
This page was last edited on 13 September 2017, at 09:12.